The fact that this book is in its third edition (the first edition was published in 1996) is a powerful tribute to the great usefulness of Dr. Meilander’s thinking. Some of the topics have been explored before but deserve fresh treatment in light of the rapid change taking place in the health care field. As we learn more about the unborn child and the technical issues of procreation, the traditional Christian thinking on this topic has been strengthened. Dr.
Dr. Meilander also attempts to deal with the changing social milieu surrounding this extremely controversial subject. As well, euthanasia has leaped to the forefront of medical ethics conversation in the last decade or so. Beginning with the legalization of physician assisted suicide in the Netherlands (and the growing abuse of that practice there), the topic has been hotly debated. The practice is now legal in at least two states, with several others having the issue on the ballot or already being considered by the state legislature. Dr. Meilander considers the alternatives, encouraging Christian physicians to refuse to practice this option for their patients—even when it is legal. Dr. Meilander also presents succinct summaries of other issues including advance directives, the right of physicians to refuse to administer treatment, organ donation, human experimentation, and progress being made in genetic engineering and offers a biblical perspective for each of his positions. 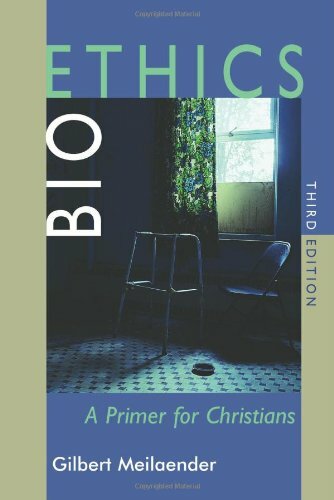 Bioethics: A Primer for Christians includes a number of pertinent references from both professional sources and the news media dealing with the issues. The book is short, which precludes an exhaustive coverage of any specific topic, but the basics are well covered and the reader can gain a solid foundation for further study.